Make Your Own Herd Of Felt Stuffed Elephants! 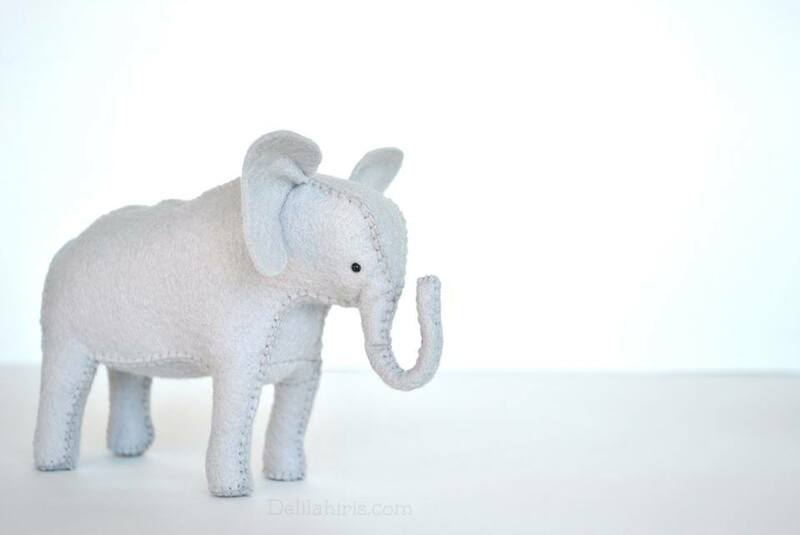 Introducing the newest of my felt toy sewing patterns – the Stuffed Elephant Pattern! Create your very own hand stitched, soft sculpture felt stuffed elephants! 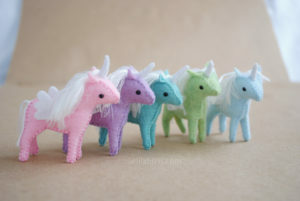 These cuties are made with sewn in wire making for an adorable and pose-able felt animal. There is wire in their limbs. But even better yet, there is wire in their trunks! This means this ultimate in pose-able stuffed toy fun! Create them for holding tiny toy balloons! Or flowers! So many possibilities!! Each finished handmade elephant stands at approximately 4 inches tall and 5.5 inches long. The pattern includes a pictured step by step tutorial on how to create these artisan quality soft sculpture felt toys. An amazing craft for anyone to learn! Head on over to the Felt Elephant Pattern page for more details and to purchase a copy of the pattern. Newest Felt Craft Projects – Alpaca and Happy Lil Cactus! You guys! I have new felt craft projects for all of your crafty peeps! I had so much fun working on these! They just bring so much happiness to my work space! Introducing my newest patterns – the Happy Lil’ Cactus and Alpaca! This Alpaca pattern is the first of my felt animal patterns including wool roving with sewing felt. But do not fret! If you’ve never tried needle felting before, then this is a perfect way to dip your toes in! As usual the pattern is meant to be hand sewn using felt! The Alpaca pattern and tutorial includes instructions on adding basic wire armature to the inside of the alpaca as well as how to sew a cute little saddle rug like the one shown in the pic. They can be used as a nifty paper weight or pin cushion, or just for decorative fun! I’ve decided to give the cactus pattern away for FREE! These Little Cacti can be made in any sort of very small pot or container. I’ve used the smallest terra cotta pot I could find at my local craft store. Head on over and check it out! And don’t forget to share with friends! As always I’d love to see what you have created! Share, share, share away! Tag #delilahiris on posts! Introducing New Stuffed Animal Sewing Kits By DelilahIris Designs! Felt craft projects made easy with my newest stuffed animal sewing kits by DelilahIris Designs! Each kit comes in a 5 by 5 inch kraft paper box and includes all the materials needed to complete the project design. Yay! 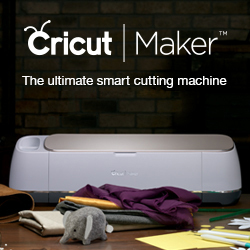 Felt crafting just got so much easier. What might you find in a DelilahIris felt crafting kit? embroidery thread, toy stuffing and more! What Kind Of Stuffed Animals and Dolls Do You Want To Make? My stuffed animal sewing kits will feature whimsical stuffed animal sewing patterns and unique doll making tutorials! I’ll be continually adding new designs. What kind of stuffed toys do you want to make? My Unicorn Craft Kits include the tutorial and materials to create a enchanting stuffed unicorn that stands approximately 8 inches tall. 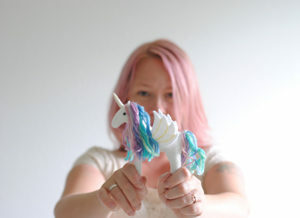 These kits make the perfect gift for the unicorn lover in your tribe! They are available in 3 different color combinations. Sew your own fuzzy and fun woodland stuffed hedgehogs! These nifty little hedgehog sewing kits come complete with fuzzy fur fabric, wool felt, and everything else needed to create these palm sized, handmade stuffed animals. 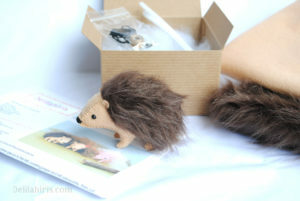 Stay tuned as I add one more color option to the stuffed hedgehog kit mix! To peruse my full line of stuffed animal kits head on over to the DIY Craft Kits page!